BBC NEWS | Entertainment | Why does Dali still delight? Why does Dali still delight? A century after his birth, why does Salvador Dali remain one of the most famous artists of all time? Dali was the pioneer of surrealist art, and some of his images - such as melting clocks, spindle-legged elephants and ants marching across hot deserts - are world-famous icons. But there are many different reasons why Dali is such a global name. Andrea Padroni, managing director of the Dali Universe gallery in central London, said it was partially because he was active in so many areas - not restricting himself to one type of art - indeed, not even restricting himself to the art world at all. "He was very curious and very keen to discover everything that could be pushed to extremes, in every kind of sector - science to architecture," Mr Padroni told BBC World Service's The Ticket programme. "The heritage that he leaves now is something that went for everything. You can find bottles designed by Dali, Dali bread." Alongside his compatriot Pablo Picasso, Dali is among the most famous artists in history, with so much of his work represented in modern culture. ""His kind of imagining was very close to the kind of imaging that you can see now in culture of young people, in video games, in movies, in science fiction," said Mr Padroni. He also had an influence on the pop art movement. Mr Padroni pointed out that Andy Warhol was a big fan of Dali - and in particular the way he was "a big self-promoter. "[Dali] was really the first one, showing everybody the way to go to become an icon as an artist." 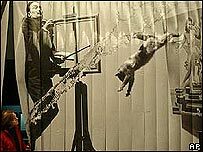 Dali moved to the US in 1940 and discovered the power of the media. Writer Ian Gibson, author of the biography The Shameful Life Of Salvador Dali, told The Ticket it was at this time that his images began to become world-famous. "[The newspapers] took up this melting watch, and it became the most famous icon," he said. "His whole life was devoted to achieving fame. He knew he had that talent, but he developed that fantastic personality with which to sell himself around the world." Ever-controversial, Dali was prepared to say whatever he thought would provoke. 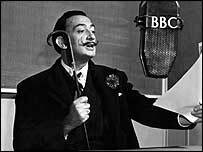 He once told the BBC that "Salvador Dali, myself, is very rich, and loves tremendously money and gold". This keen self-promotion through controversy, some art critics argue, is something that has been picked up by a number of modern British artists such as Damien Hirst and Tracey Emin. "All the time he was playing with his fame. He was very aware of the power of words - this is very powerful in the Spanish tradition," said Mr Padroni. He said it was clear that modern art had borrowed from Dali not only in approach but in ideas too. "I think his impact is very strong - [modern artists] really reuse and reinterpret a lot of surrealism," he argued. 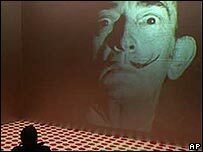 However, Dali is not so revered in his home country, Spain, where some see him as a traitor. 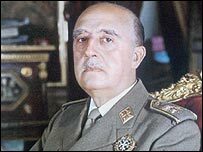 On his return from the US, Dali supported the fascist Franco regime - even though it had been responsible for the death of his best friend, Garcia Lorca. Dali also abandoned his life-long atheism for Catholicism, even meeting with the Pope. "Spaniards would feel that he betrayed his former self, he betrayed surrealism, he betrayed Spanish democracy, he betrayed his talent as a painter," Mr Gibson said. But he said this was perfectly typical of Dali. "He's a very difficult person to get to know. He's no normal human being." "This is one artist the public still have a taste for"